Irritated by the smell of your normal deodorant? 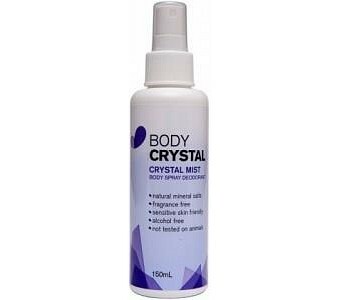 Stop masking the odour and get to the root of the problem with Body Crystal Crystal Mist deodorant. Fragrance free, crystals create an invisible layer that kills bacteria. Let your body sweat naturally without the odour. Use anywhere on the body to prevent body odour. Ozone friendly and safe to use. Ideal for sensitive skin that is easily irritated. Completely odourless Crystals & Sprays available. Non stick. Contains no Aluminium chlorohydrate / Aluminium chlorohydroxide, no alcohols, no parabens.